Yokohama has an important history when it comes to Japan’s connection to and isolation from the rest of the world. It quickly grew into one of Japan’s biggest port cities after Commodore Matthew Perry demanded the country open for trade with the West in 1953. For its first couple of decades after the Port Opening, foreigners were restricted to the Kannai neighbourhood (still containing many of the region’s most intact examples of colonial architecture), but this did not stop Yokohama from becoming the site of many Japanese “firsts,” such as the adoption of western fashion, ice cream, beer, and gas lamps. Thus it was quite fitting for this year’s Yokohama Triennale to take the title, “Islands, Constellations & Galapagos,” and deal with the themes of connectivity and isolation. While connectivity is naturally an important element in international art festivals—it is a time in which artists, gallerists, press, collectors and visitors can come together—the theme of isolation allowed the festival’s organisers and artists to make the observation that our world right now is perhaps not as connected as it should be. Specifically, the festival’s introduction points to the United Kingdom’s withdrawal from the European Union as well as the rise of populism across the democratic world. Compared to 2014, this Triennale had a tight selection of 38 artists/groups and one project displayed at Yokohama Museum of Art, Yokohama Red Brick Warehouse No. 1, and the basement of Yokohama Port Opening Memorial Hall. This curation led to very accessible exhibitions, in which artists with larger gallery spaces were able to develop a better overall picture of their practices, and audiences could spend more time with each artist. At both Yokohama Museum of Art (YMA) and Yokohama Red Brick Warehouse No. 1, art works were frequently paired with opposing themes: some conveyed the warmth of connectivity while others worked with the chill of isolation. 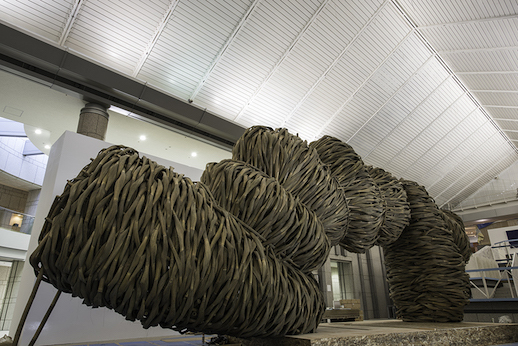 In the YMA foyer, Joko Avianto’s gigantic sculpture, in which organic bamboo branches were woven together, was a beautiful representation of the strength found in one’s connections with others. 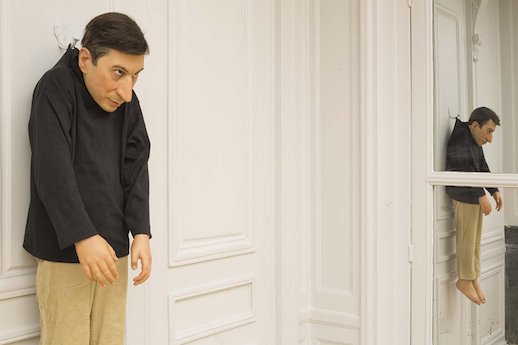 On the other side of the wall, Maurizio Cattelan’s Untitled sculpture of his own likeness being hung by the hook of his blazer was more like a cry for help. There was a strong selection of Japanese artists, including sweeping panorama photo installations from Naoya Hatakeyama. His epic landscapes give a sense of awe and isolation from civilisation. Meanwhile, nearby, Natsumi Seo’s small watercolour landscapes were made with the specific purpose of connecting with survivors of the 2011 earthquake and tsunami of Northeast Japan. Displayed alongside quotes from her subjects, the paintings were a way of describing events when people don’t have the words. Also responding to the 2011 disasters were “Don’t Follow the Wind” and an installation by Yukinori Yanagi. “Don’t Follow the Wind” began as a project installing art in Fukushima’s radioactive contamination zone. At Yokohama Red Brick Warehouse No. 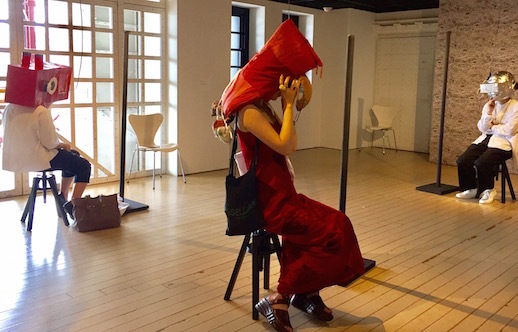 1, virtual reality headsets offered a 360-degree view of the artworks in a house and on streets abandoned as a result of the TEPCO Fukushima Daiichi nuclear disaster. In one work, an installation by Ai Weiwei, the lights of a now-unoccupied home is programmed to switch on and off at times that the occupants would normally be there. The work was presented to visitors through video, still images and commentary, which stated that these lights will be the only ones switched on for miles. Meanwhile, in the basement of the Yokohama Port Opening Memorial Hall (a ten-minute walk from Don’t Follow the Wind), Yukinori Yanagi has installed a powerful reminder of Japan’s nuclear legacy and the continuing threat of atomic doom. In the dark and rumbling rooms, visitors stepped over broken tiles and around collapsed wooden structures. It was as if a bomb has exploded, and we find ourselves stuck in the basement. One illuminated eye, amongst the rubble, gave a hint as to what had occurred with a mushroom cloud reflected in its iris. In a room nearby, lines from Article 9 in Japan’s constitution—the part preventing Japan from military aggression and subject to changes of interpretation by Prime Minister Abe—lay broken apart on the ground.